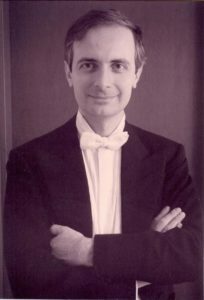 Vittorio Parisi studied at the G.Verdi Conservatorium in Milan with Azio Corghi (composition), Piero Rattalino (piano) Mario Gusella and Gianluigi Gelmetti (conducting); he also attended masterclasses with Kirill Kondrashin (he was the only italian pupil of the famous Russian conductor) and with Terence Lovett and George Hurst in England. Following his graduation he was immediately appointed teacher of student orchestras in the Verdi Conservatorium and worked as assistant of his former teacher Gianluigi Gelmetti in Italy and Europe for a few years. He began his conducting career in late 1979 (Bari, Teatro Petruzzelli) working in theatres , symphonic and chamber orchestras including Teatro dell’Opera (Rome), Teatro San Carlo (Naples) La Fenice (Venice) Piccola Scala (Milan) and many others, and all the italian radio orchestras (RAI) in a repertoire ranged from baroque to contemporary music. In Rome Opera House he has conducted 8 new productions in a span of 11 years. international festivals and seasons, conducting in USA, Canada, Germany, France, Switzerland, Poland, Turkey, Slovakia, Netherlands, Romania and Albania and he has conducted also a concert at presence of His Holyness the Pope John Paul II, always with great success and excellent reviews. In October 2004 he has made is Australian debut with the Sydney Symphony Orchestra in the Sydney Opera House In 2006 he made his New Zealand debut with the Auckland Philharmonia conducting the first and the second concert of the main season. Always interested and curious about new forms of music and art and about rediscovering of symphonic works and operas he has conducted many first performances on stage and first modern performances including “L’Ape Musicale” by Lorenzo Da Ponte, a “pastiche opera” prepared by the Mozart librettist on music by Rossini, Mozart and others, recorded live on a cd in Teatro La Fenice in Venice. He conducted also the first complete performance since the premiere of “Marie Galante”, opera by Kurt Weill. He has conducted world premiere of works by Petrassi, Lindberg, Corghi, Castiglioni, and dozens of other contemporary composers, often requested by composers themselves, and collaborating with Luciano Berio and John Cage, often conducting music in sycro with tapes. In 1994 he was requested by the composer for the first performances of Azio Corghi’s opera “Pia” in the prestigious Chigiana Academy in Siena. He has collaborated with musicians such as Paul Badura-Skoda, Joerg Demus, Richard Goode, Michele Campanella, Francois Joel Thiollier, Lilya Zilberstein, Angela Hewitt, Andrea Padova, Mario Brunello, Rocco Filippini, Massimo Quarta, Milva, Amii Stewart, Alirio Diaz, the famous italian dancer Carla Fracci, a lot of worldwide known opera singers, and some of the most famous european stage directors, including the well known italians Luca Ronconi and Roberto De Simone. Vittorio Parisi has recorded extensively, live or in studio, for Naxos, Dynamic, Bongiovanni, Nuova Era, Stradivarius and many of his performances have been recorded and broadcasted by Italian Radiotelevision (RAI) and by the Radios of many countries where he has performed.